In the last decade mobile industry has witnessed a great change.It is one of the fastest growing industries in recent time. 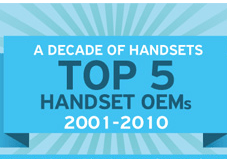 Today I’m going to share an interesting Infograph about the top 5 mobile handset manufactures who dominated in the last decade (2001-2010).This infograph is created by VisionMobile, a mobile market analysis company. This infograph clearly shows how mobile industry has changed in the last 10 years.Some companies lost their market share and some gained.